Although it perhaps doesn’t have the range of services offered by larger exchanges such as Betfair, signing up to and using Matchbook is about as simple as it could be. Our Matchbook review will take you through the pros and cons of the service and highlight its main features. If you’re new to Matchbook you can obtain a new customer offer when signing up. The current valid Matchbook bonus code to enter on the registration form is MBMAX. With this promo code, you’ll get all the best offers from Matchbook. Right now, you can get the following deal for betting exchange: £10 risk-free bet. The offer should be automatic after signing up, however if you notice that it has not been applied correctly, we suggest getting in touch with customer services for assistance. Meanwhile, if you are more interested in casino gaming, you should know that Matchbook casino also runs new player deals. The current promo is 100% up to £100 + 100 Wager Free Spins, which is a competitive bonus in the online casino world. Bear in mind that T&Cs do apply on the deposit bonus, including wagering requirements. To claim either or both of these offers, simply click below. Matchbook offers a varied range of betting markets on a host of sports, their most popular being football, horse racing, tennis, baseball and golf. Backing and laying on football markets are the best catered for with all major football leagues available to bet on including Premier League, La Liga, Bundesliga etc as well as international matches and various world leagues being covered. Although Matchbook has markets available on various American sports, the list is not comprehensive and the platform doesn’t match up to Betfair for overall experience either. For UK punters, the horse racing book is popular and includes all the major upcoming races as well as the ‘treble your odds’ offer. The growing trend for matching bets on tennis is something the site looks after, with coverage supplied for all major tournaments in both the men’s and women’s tours on Matchbook. Football markets are the best on this exchange though with liquidity being very favourable versus Betfair. Markets are formed well in advance and are easier and quicker to get to grips with on Matchbook. One thing we are pleased about in the Matchbook review are the commission rates. Rather than applying a margin or ‘overround’ like traditional fixed odds bookmakers, exchanges like Matchbook show the price as it is and then charge a commission on bets placed once the event is settled. Commission rates depend on the type of market, though the typical figure is 1.5% which is terrific when compared to Betfair’s usual 5%. As a promotional offer, Matchbook sometimes offer 0% commission on certain markets, especially on big events. The Commission is charged regardless of whether your bet is successful or not, though at these lower rates those confident of success should be jumping all over this platform. Matchbook has two different commission rates, the one you get depending on whether you accept another users offer, or whether they accept your offer. When accepting an existing offer in a market the standard commission rate will be 1.5%. If you post an offer, which another user then matches, the standard commission rate will be 0.75%. For example, if we placed a bet of £100 on Chelsea to win at 1.60, our potential profit would be £60.00 Chelsea winning would mean that we are charged 1.5% of £60 (£0.90). Accepting odds already posted on Matchbook means paying half of this, 0.75%. The app is available across all devices for both Android and Apple customers, even on Apple Watch and iPad meaning no matter what technology you prefer, you should be able to get your bet on when you’re on the go. A positive in the Matchbook review is that all the top football leagues are represented and the exchange’s liquidity is very good, making it a fair alternative to Betfair when betting on football. Backing and laying are made easy on the Matchbook app meaning you can do this even when you are commuting, at the game or even just lounging on the sofa. Due to regulatory restrictions, the Matchbook app can only be accessed from certain regions. With this in mind, ‘location services’ will need to be switched on when using the app. A 3G or 4G signal (if not on WiFi) will be needed to download the app onto mobile phones. At present, Matchbook offer only their standard app and have no specific sign-up or other bonuses for Matchbook app or mobile users, although the regular welcome offer still stands. 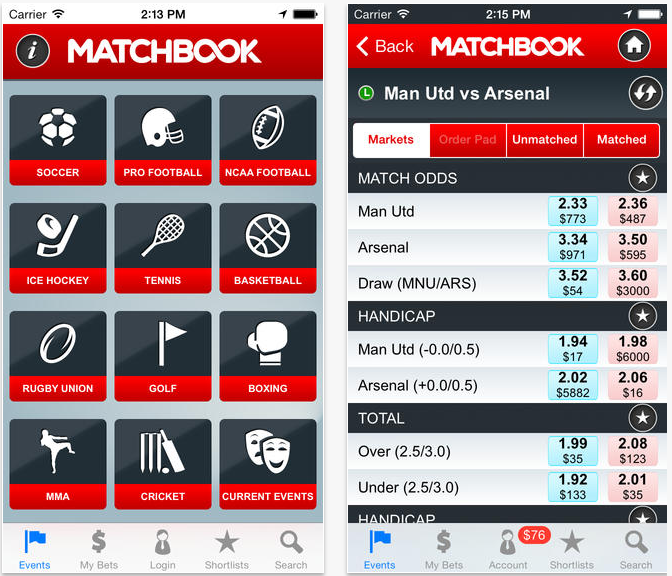 Live betting is available on Matchbook, something crucial when acting as a betting exchange. Various in-play markets are available especially on football matches though the major let down is the lack of live streaming. Although the depth of live betting offered is not quite the same as the big boys such as Bet365 or Ladbrokes, Matchbook’s offering continues to grow and the addition of live streaming would put it right up in the top echelons. Live betting is offered on NBA, NFL, NHL and MLB as well as on football and tennis meaning there is already a fair choice of sports to match live bets on. Depositing funds is simple and 24-hour customer support is available. Simply login, go to the members area and choose ‘deposit’ or ‘withdrawal’. Withdrawals to the above banking options are simple, the timeframes being. One very slight negative in the Matchbook review was the customer service, given that they cannot be reached 24/7 on all platforms. So, availability is OK without being perfect and response times are good. The service is friendly and informative, though the web page’s FAQ section will provide answers to most of the important questions without the need for an operator. As a fledgling exchange, Matchbook has a way to go to beat the likes of Betfair but is a very reasonable platform on which to bet. The mobile app is quick and smart to look at so in terms of its usability there can be no complaints. The welcome bonus is fair and easy to get, simply join up online and type MBMAX on the first page of the signup form.